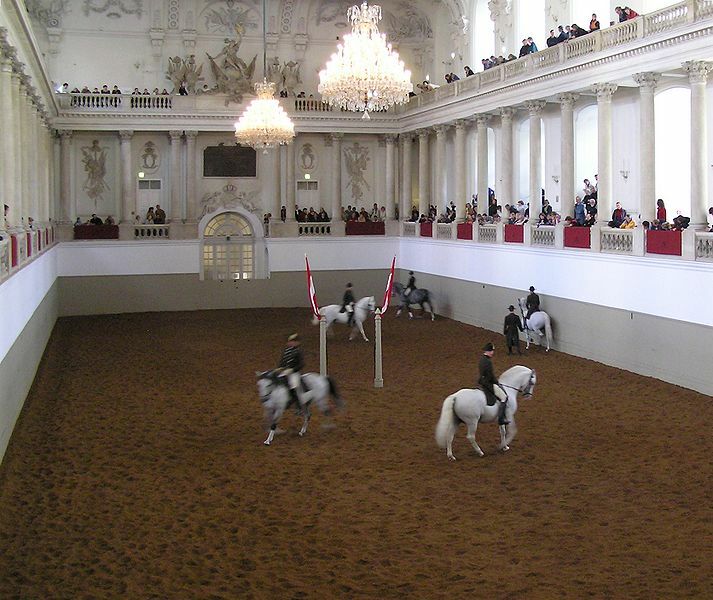 Guest author Lisa Pritchard, a Level II Centered Riding Instructor, recently visited the 17th International Centered Riding Symposium in Vienna. As part of the visit, she spent some time at the Spanish Riding School watching the world famous Lipizzaner horses go through their practice routines. “It was a fabulous experience to watch these magnificent animals practicing their work. Each horse only works for 30 minutes at a time, but goodness, they work hard, and probably use as much energy as most horses that are hacked out for 3 or 4 hours. It is interesting, they are obviously warmed up a bit before coming into the school as they start work immediately and work without a break for the full half hour. At the end of the session the riders all line up, dismount and give the horses a sugar lump treat from a special pocket sewn into the tailcoats that the riders wear. 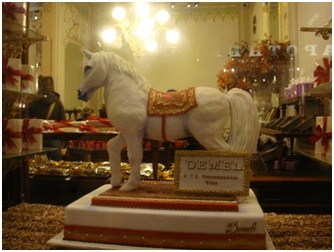 Anyway, we were soon gearing ourselves up for the main event, a private event (Privatissimum) at the Spanish Riding School, followed by a tour of the stables and then a buffet supper in the apartments there. The Privatissimum was just fantastic. We got to see snippets of some of the training of the horse and rider, with a five minute lunge lesson for one of the eleves which the public normally never sees. The lunge horse used in the demo usually does Caprioles in his performances and when we clapped enthusiastically he thought he was on show. By goodness that eleve’s seat was good! The young horses were shown in their first stage forward work, and then we saw some of the later training with a more mature horse. Highlight of the Privatissimum was Chief Rider Andreas Hausberger giving his longlining performance with his 23 year old stallion Conversano Dagmar. This was truly a sight for sore eyes. Without any visible aids Herr Hausberger and Dagmar performed Piaffe, Passage, endless Tempi changes (he can do up to 50 at a time), half pass in canter, pirouettes, in fact the whole range of advanced dressage movements. A phenomenal demonstration of correct training and what can be achieved when horse and rider know each other so well. We applauded so hard our hands were sore. When we got to tour the stables we saw Conversano Dagmar tucked up in his loosebox. He is TINY, must only be about 14.2hh, and looked nothing special at all, a little straw covered pony (he’d had a good old roll), yet in the performance you just couldn’t take your eyes from him as he has so much presence. The stables are wonderful as are all the stallions. 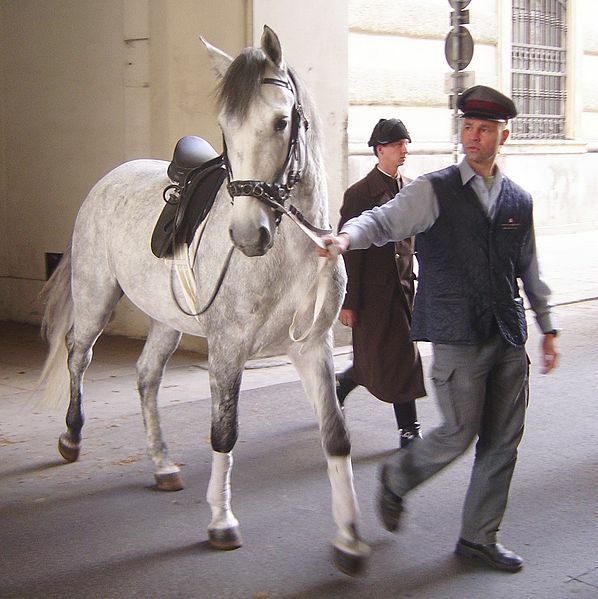 Our guide was at great pains to let us know about the holidays that the horses have and was quite apologetic about their lack of turnout in Vienna, but honestly, there wasn’t an unsettled animal in the place. Every stallion was calm, relaxed and quite unfazed with their visitors. They only have bars between each stable so the stallions can nose each other and give each other a bit of a scratch and a more delightful group of animals you couldn’t wish to see. After the tour we trotted back into the apartments at the Spanish Riding school for our wine and buffet supper. The reason for the Brits’ sartorial efforts then became clear as Andreas Hausberger was waiting for our little group and spent the evening with us answering our many questions and giving us fantastic insights into the history of the Lipizzaner, the Spanish Riding School and the training of both horse and rider.